The Phi and I are still doing our 365 Photo Project and yesterday we were outside eating ice pops and waiting for Poppa to come home from work. We decided it was time for our POTD (photo of the day!). Since we are on picture #140 now I struggle to find new ways to get a picture done. So yesterday I put the camera on the ground, set the timer and there you go. I was like "huh?" So PR Dad googled and we smacked our foreheads when we realized that G$ was referring to the sixth UK studio album by The Beatles. 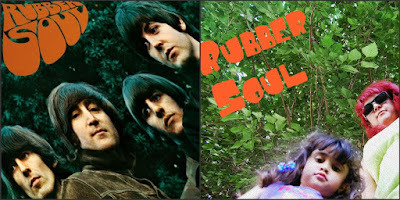 And G$ was right, our picture was very Rubber Soul. Do a famous album cover series. Now that I am on summer vacation I can get my guitar out. I have been practicing Norwegian Wood from that album. G$ was right on with this one. It would be hard to come up with different photo every day but you do a good job!